Determined to avenge her father’s death, a young girl adopts a vigilante persona. In a time of swords, full skirts, tricorn hats, and horse-drawn carriages, 18-year-old Maud lives in the quaint French village of Perigord with her beloved father, a blacksmith. When Maud’s father is viciously murdered one night, she vows to head to Paris for vindication and finds herself staying with her estranged, aristocratic grandfather, a man who thinks it best that she become ladylike and marry quickly. 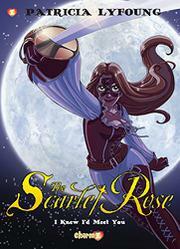 Tired of rigid social mores and inspired by a Robin Hood–esque masked man only known as the Fox, Maud decides to become the Scarlet Rose, a do-gooder working under the cloak of darkness (and clad in plunging bodice, very tight breeches, and thigh-high boots). Originally published over a decade ago in French, this quirky graphic import seems to rely on its heavily stylized, full-color, anime-inspired art to overcome narrative incoherence. Lyfoung’s plotting feels like a clunky pastiche of Robin Hood and The Scarlet Pimpernel set against a lavish, evidently all-white pre-revolutionary backdrop. The panels, while small and orderly, are quite busy and crowded, working in unfortunate opposition to the detailed nuance of the time period. Maud embodies a stark dichotomy, quickly shifting from an independent and smart female character to a ditzier one who falls in insta-love and becomes irritatingly clingy. It ends with an unsurprising cliffhanger, but demand for subsequent volumes may be low.